Extras: Halloween cookie cutters plus candy eyes and a little white chocolate or royal icing as glue. Mix flour, activated charcoal and butter in a food processor until you have something resembling fine bread crumbs. You can do this by hand as well, it just requires some patience. Then mix in the sugar, before adding egg and syrup. Mix until a ball starts to form in you foodprocessor. Take out the dough, and work it together till you have a uniform easy to work with dough. Put the dough in a bowl, cover and place it in the refrigerator to rest for about an hour. After about an hour in the refrigerator take out the dough and let it sit for about 30 minutes at room temperature before you attempt to roll it out. You can then roll in out between two pieces of parchment paper or on a floured surface. Roll out the dough evenly to a thickness of about 2 mm, and use your favorite cookie cutters to make the shapes you want. 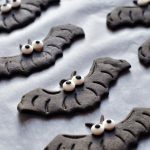 For these I used the Halloween Shaped Cookie Cutters from Wilton. A little tip: coat the cookie cutters with a little flour, that way they don’t stick to the dough. Place your cookies on a baking tray fitted with a piece of parchment paper. The recipe makes about 3-4 plates depending on how closely you space them and how thick you roll out the batter of course. Bake them at 180 °C (356 °F) in a preheated oven for about 8 minutes. Note baking time can vary depending on your oven, and the thickness of your cookies. Because of the black color it can be relatively difficult to see when they have had enough…. so you have to find your sixth sense for sugar cookies and just trust your gut. I generally prefer sugar cookie baked slightly too long than too short, which makes it a bit more forgiving in terms of hitting the right baking time. Once baked, remove them from the oven, and let them cool down on a wire rack. If you want to decorate them, let them cool down completely before you start. I tend to not decorate mine, I feel like the cookie is more than sweet enough on its own without extra sugar on top. However for these I wanted to give the bats some whimsical eyes……. Just because it is fun. I just used some simple candy eyes, which I glued on with a little white chocolate (you can also use royal icing as the glue). I used coconut sugar for these, mainly because I like the deeper flavor of the coconut sugar compared to beet sugar or cane sugar. Especially when no other flavors are added, like vanilla. However I noticed that I had to work quite a bit with the dough before the sugar was fully incorporated. I used two tsp of activated charcoal for these cookies, the dough looks perfect, but they do loose a little of the black intensity when baked. I will add 3 tsp next time I bake them. For I used agave syrup, but you can use any syrup you like.